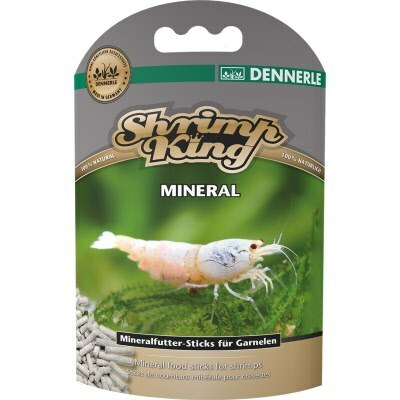 Feed your shrimp Dennerle Shrimp King Mineral Food sticks for targeted nutritional supplementation with plenty of minerals. With 7% calcium and 10% montmorillonite, this formula supports stress-free molting and a tough exoskeleton. These water-stable food sticks are all natural and sink to the bottom without disappearing into the substrate. Shrimp King Mineral has the same high-quality ingredients as Shrimp King Complete, but with more minerals. The clay mineral montmorillonite (10%), pure calcium-carbonate (5%) and coralline red algae (10%) offer all shrimp plentiful calcium and other minerals, plus essential trace elements. Shrimp readily utilize the natural calcium found in coralline red algae due to its extraordinary bioavailability. Shrimp do not have gastroliths (stomach stones) like crawfish do, so they must habitually consume minerals. All the Shrimp King diets are free of synthetic colors and preservatives, and free of fish meal – guaranteed. Tip: Shrimp King Mineral is also suitable for molting crawdads, dwarf crayfish (CPOs), crabs, and snails.